NBA Jam recently made a reappearance that looked back to its arcade roots, and rumors are circulating that NFL Blitz is up next. In the mid 1990s, extreme versions of sports games like NBA Jam and NFL Blitz were all the rage in arcades and on consoles. Though subsequent versions of these titles' original versions somehow missed the mark, NBA Jam was faithfully recreated this year by EA right down to its politicians. According to rumors, the same treatment is in store for NFL Blitz. An "industry insider" told Giant Bomb this month that a reboot of the extreme football franchise was also in the works at EA. The insider said that EA Tiburon, the current home of NFL Blitz creator Mark Turmell, was taking on the game's development duties. 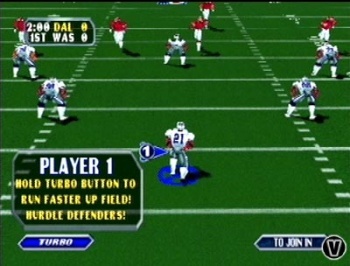 Any potential NFL Blitz project is still in the very early stages if the insider can be believed, but it will reportedly be released on multiple consoles in 2012. There apparently won't be any of the business that occured with NBA Jam where it quizzically was only coming to the Wii and then later released on the Xbox 360 and PS3 due to various circumstances. The original NFL Blitz turned football into a high-scoring 7-on-7 game where late hits were not only allowed, but expected and incredibly enjoyable. It successfully implemented the basic strategy behind the game of football, forcing players to use smart offensive and defensive plays, but also added an extreme element and a fast-pace that made it a great arcade multiplayer game. There have been many Blitz titles released since the original in 1997, but in my opinion they took away the game's fun simplicity. If this rumor ends up coming to fruition, and it seems likely, we should all look forward to once again tackling friends with a German suplex, and then unnecessarily delivering a leg-drop just for kicks. Violence is fun.